I’m having a really good day but I still think this Beer Bike hero has me beat. 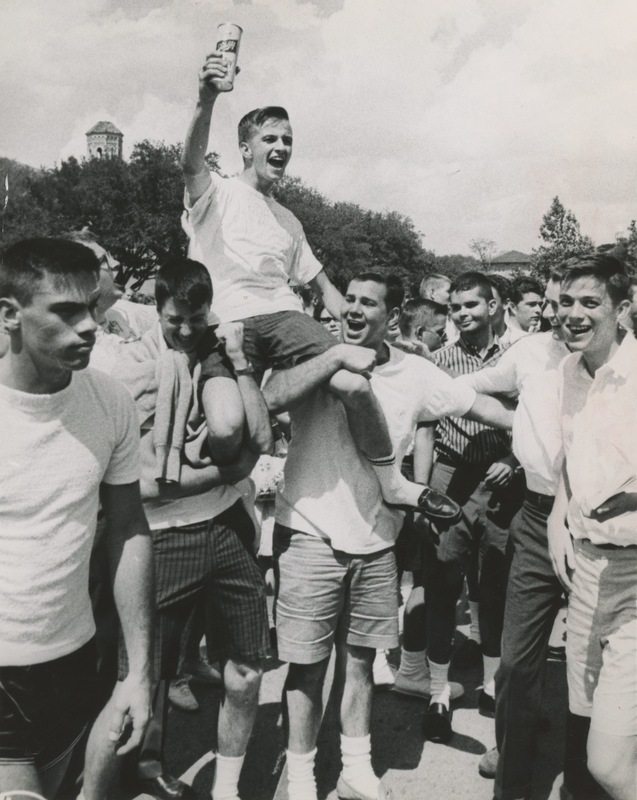 That was just a couple of years before my time, so I don’t recognize any of those students, but…they must have been Will Rice guys because e’rbody knows that Will Rice dominates the Beer/Bike Race!!! Haven’t heard that slogan in years! Brought back memories from growing up in the northeast. As I recall, the beer can was a Schlitz tallboy, containing 24 oz instead of the usual 12. For the beer/bike race there was a hole punched in the bottom that you placed your finger over. When it was time to drink you released your finger and the air inflow through the hole allowed the (flat) beer to drain quickly and smoothly. Bill, you are absolutely correct in all your details. Hate to tell you this Randy, but Hanszen dominated the mid 60s, winning in 64,65 and 67. In 66 Roy Meals and Chuck Latourette both went down when the adhesive holding the tubular tire to the rim failed, causing the tire to roll off the rim. Hanszen still came back to finish 2nd by less than a second. In the 66 Campanile there is a great picture of Roy as he is falling.